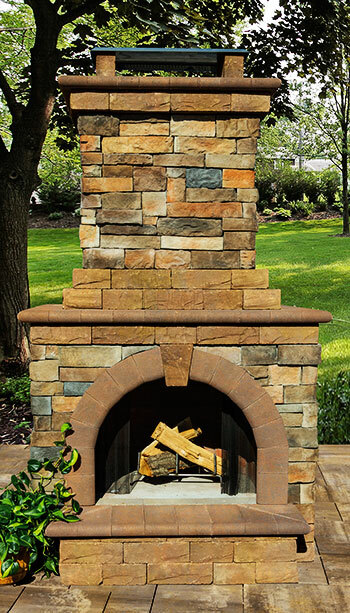 For those interested in more natural stone character, we are introducing this woodburning fireplace version that features Cambridge Stone Veneer facing in Canyon Ledge and Ledgestone Wall accenting. Two of our most popular trendsetters are paired-up for a look that’s unique to Cambridge. visual appeal of accent lighting right on your patio or within your outdoor living room setting. 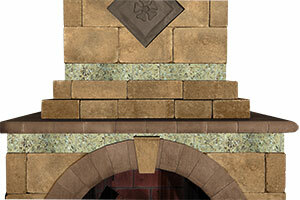 Note the arched hearth opening and a recessed cast stone diamond-shaped, decorative medallion. one or two firewood box extensions, also fully assembled. Left Side, Sold Separately):34″ long, 36″ deep and 38 1/2″ high. Firewood Box weight: 1,950 lbs. each. 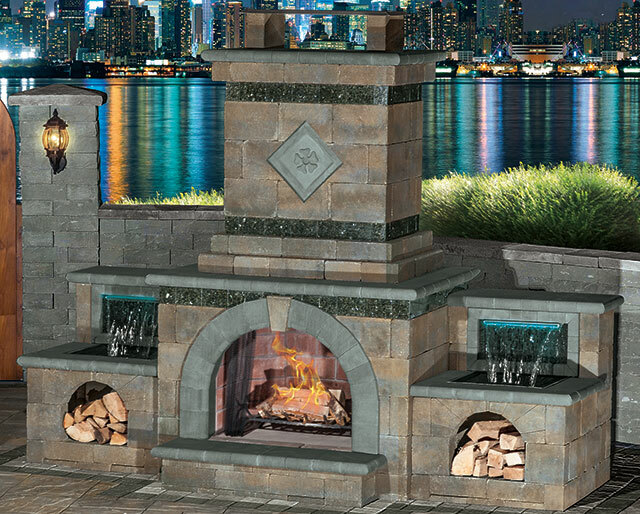 This Outdoor Fireplace Can Be Put Together In Less Than 1 Hour! the fireplace in the future. Download the Assembled Fireplace Instruction Manual. with Cast Stone Surround in Bluestone. 2 color choices: Bluestone and Chestnut. Cast Stone Surround in Bluestone. 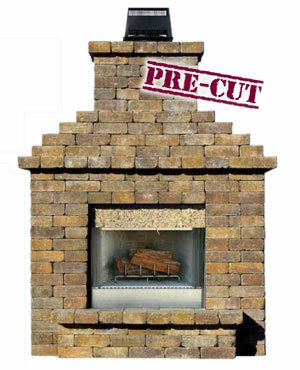 Designed with small individual paver units, the Cambridge Pre-Packaged Olde English Paver Fireplace Kit has all the characteristics of a traditional brick fireplace. 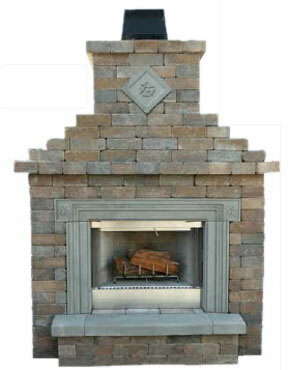 This fireplace is truly elegant and is pre-packaged complete with three pallets of Olde English Pavers, six concrete lintels and a top of the line Lennox™ stainless steel fireplace. 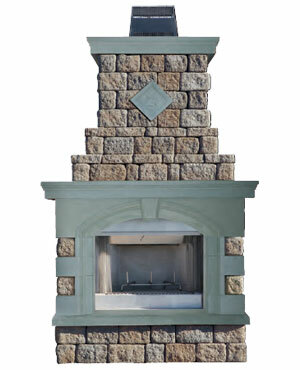 It features stainless steel curtain pull screens, a stainless steel fire grate, a 4-foot high, air-cooled chimney and black powder coated termination cap complete with galvanized flashing. 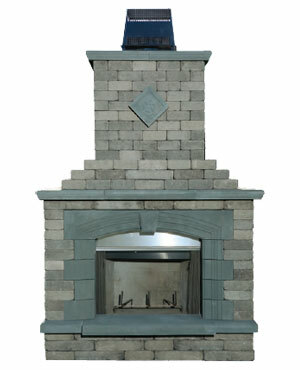 Also standard are refractory brick panels inside the firebox and five 6″ x 6″ polished granite tiles for the face on the front of the unit. 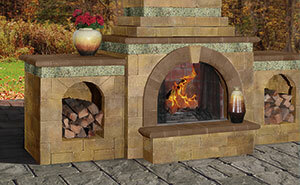 Shipped as a wood burning unit, the fireplace can also be converted to gas. See instructions. Only minimal cutting of approximately 23 pcs. of Olde English Pavers is required. Step-by-Step instructions in English and Spanish are included. Onyx with Cast Stone Surround in Bluestone. 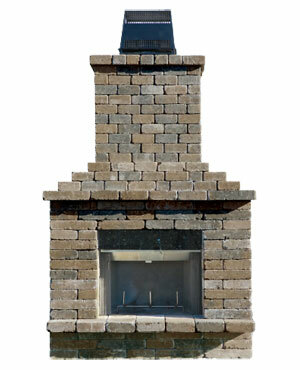 The MaytRx Fireplace is available in two distinct rock faced textures: Split Face and Renaissance. 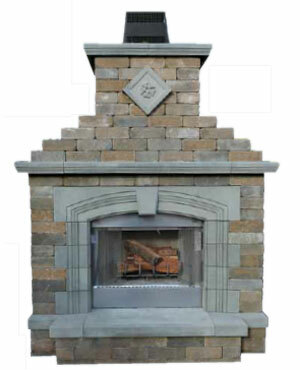 If contemporary style is preferred, this fireplace design is perfect. 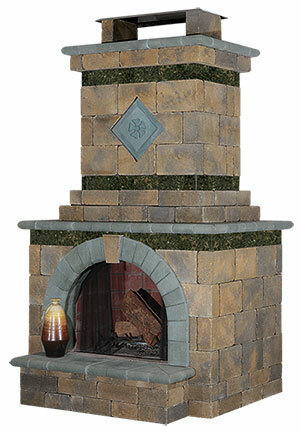 The kit is complete with four pallets of MaytRx wallstones, two concrete lintels and a top of the line Lennox™ stainless steel fireplace and features stainless steel curtain pull screens, a stainless steel fire grate, a 4-foot high, air-cooled chimney and black powder coated termination cap complete with galvanized flashing. Also standard are refractory brick panels inside the firebox and six 6″ x 6″ polished granite tiles for the face on the front of the unit. Ready to Install… absolutely NO cutting necessary. 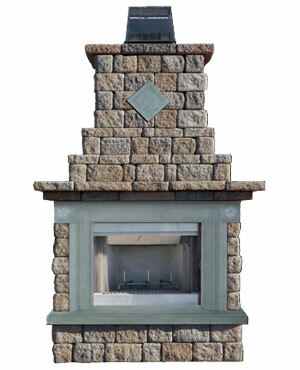 Shipped as a wood burning unit, the fireplace can also be converted to gas. See instructions. Step-by-Step instructions in English and Spanish included. Add to all Cambridge Kits. 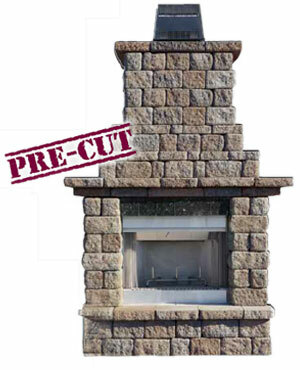 Cambridge Pre-Cut & Pre-Packaged Olde English Wall Outdoor Fireplace Kit. 12″ x 12″ square medallion. 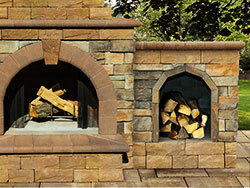 The largest of the three Cambridge Pre-Packaged Fireplace Kits, the Olde English Wall Fireplace is the perfect kit for extending your outdoor living space. Complete with six pallets of Olde English Wall, six concrete lintels and a top of the line Lennox™ stainless steel fireplace, it also features stainless steel curtain pull screens, a stainless steel fire grate, a 4-foot high, air-cooled chimney and black powder coated termination cap complete with galvanized flashing. Also standard are refractory brick panels inside the firebox and five 8″ x 8″ polished granite tiles for the face on the front of the unit. Although shipped as a wood burning unit, it may also be converted to gas. See instructions. Ready to Install… absolutely NO cutting necessary. Step-by-Step instructions in English and Spanish are included. opening when the fireplace is not in use.